Still busy with holiday prep and too tired to write when not busy. However tonight I can't sleep so seems I've got the time to but not much of an inclination. Weather is becoming increasingly nice, sunny and temps in the 50's. Went to the Dollar Tree to get wrapping paper as Erin is supposed to come help wrap gifts. Bought a few Christmas tins to hold sweets for gifts. Realized I haven't been particularly charitable this year so need to find a salvation army bell ringer spot and donate. 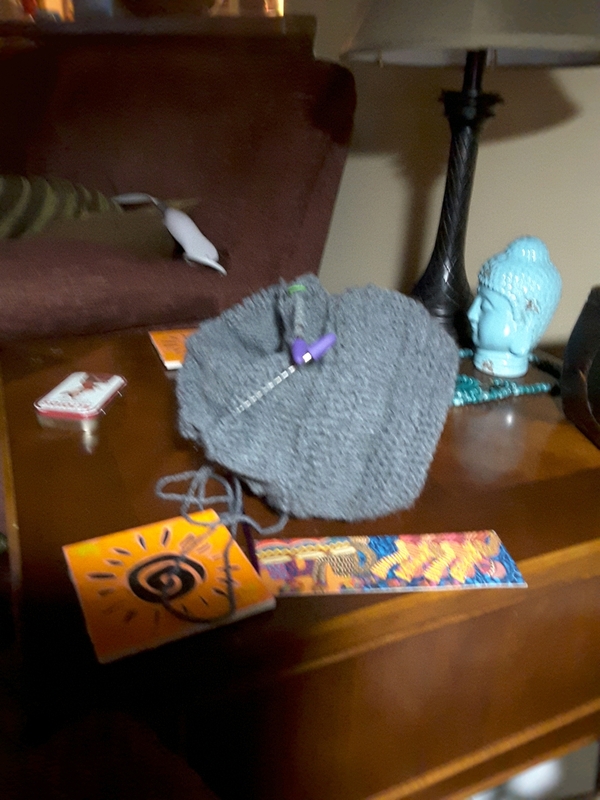 Been knitting as much as possible on as hat I'm making for Trent. Arthritis in right hand making that a challenge but still hope that it will be finished in time. Need to try bed again soon. I will need to be energetic tomorrow. Erin asked if I want to go with her and the kids to Florida, leaving the day after Christmas. I'm thinking I'll say no for lots of reasons. But it's on my mind, contributing to my lack of sleep. Mmm. Panuche. (Homer Simpson voice, lol.) My parents used to make that, in the late evening, after the kids were in bed. I'd go to sleep dreaming of getting up the next day and conducting endless raids on the round cake pans in the fridge which held the sugary goodness but didn't keep it safe. Meantime, hoping you're somehow able to get the rest you need. A lot of times, these days, even when I do get to sleep, I'll wake up for one of those bathroom trips and something will pop into my head that makes an immediate return to bed, to sleep, almost impossible. So I know something about what you're experiencing. It's somewhat easier for me, I think, because, in between other things, my time and this house are my own. I've long found little enjoyment in the season, rather it stresses me out. And nowadays with no little kiddos, there's not much magic either. I dread the get up in the night to pee thing, so hard to to go back to sleep then, but when ya gotta go... Last night I stayed up and watched 3 episodes of "Turn" on Netflix. Every year it's a toss up between panuche and pralines, panuche wins this year. I'm having a hard time staying out of it. My fave! You are the first human I've met who is familiar with it. More things checked off the list today. A bit of time to read and lie about and "revel in my abandon." How cool to have twin sisters, or maybe not. Seems so to me as I have only one brother. The only thing I remember my parents doing together was cleaning the big picture window. I don't think they enjoyed it though. What is panache? The hat is looking nice, and very close to finishing, as I'm guessing you are about to start reducing stitches. Penuche is candy, brown sugar fudge usually made with pecans but we used hickory nuts. You are right about the hat, 11 more rounds then time to shape the crown, should be done by Christmas.